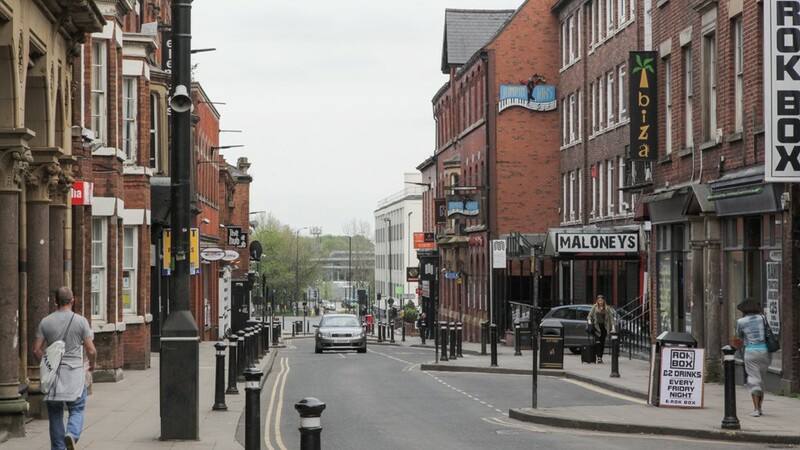 Wigan is a town within Greater Manchester, located approximately 322 km (200 miles) north west of London, 35 km (22 miles) north west of Manchester, 21 km (13 miles) north of Warrington and 32 km (20 miles) north east of Liverpool. The town is connected to the national railway network with a fastest journey time to London Euston of 1 hour 55 minutes. Manchester Airport is approximately 40 km (25 miles) to the south east and Liverpool John Lennon Airport approximately 32 km (20 miles) to the south west. 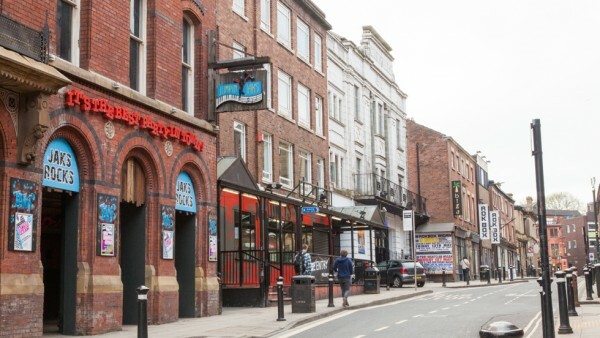 Wigan Borough has a population of approximately 321,000 people. There are currently over 9,000 businesses in the borough supporting nearly 120,000 jobs. Major employers include Heinz, Wincantons, AB World Foods, Hovie, Tesco and ASDA (Source: Wigan Council). The town benefits from good road communications being situated approximately 5 km (3 miles) east of the M6 (Junction 26) / M58 (Junction 6) intersection. Junction 5 of the M61 Motorway is approximately 8 km (5 miles) to the east. In addition, the A580 is approximately 11 km (7 miles) to the south and provides direct access to both Liverpool and Manchester. The subject property is situated within the heart of Wigan town centre and occupies a prominent position fronting King Street which is regarded as the main leisure destination within the town centre. 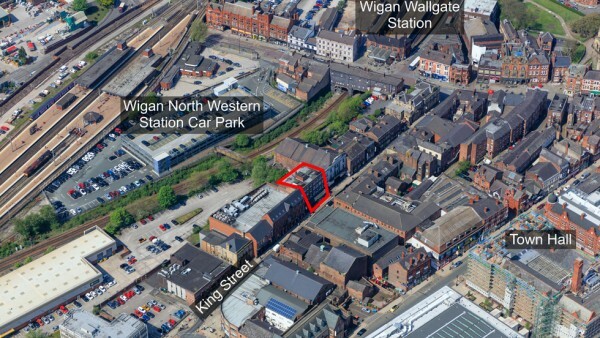 Wigan North Western train station is immediately to the rear of the property and Wigan Wallgate station is only a few minutes’ walk away. 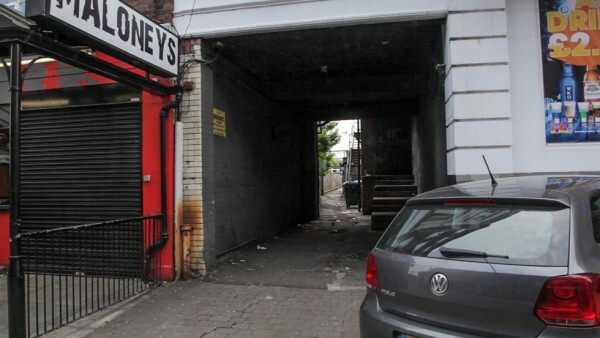 There are numerous public car parks surrounding the property. 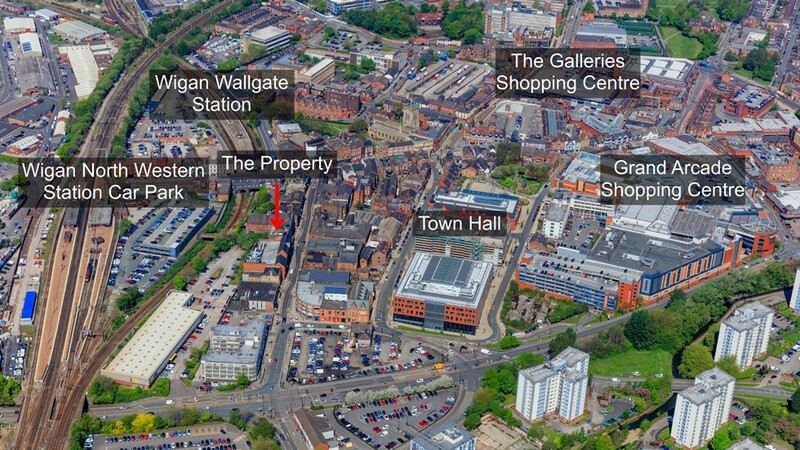 The property is in close proximity to the town’s principal shopping areas of Standishgate and the Grand Arcade Shopping Centre which is the dominant shopping destination within the town. Comprising approximately 39,485 sq m (425,000 sq ft) of retail space, the Centre has over 40 stores and 900 car parking spaces. Key retailers include Debenhams, Marks & Spencer, TK Maxx, H&M, Next, Boots and River Island. Grand Arcade has an annual footfall of 6.3 million. Other leisure occupiers on King Street include The Hub, Mortimer’s, Revolution, Liberties, Reflex and Evolution. 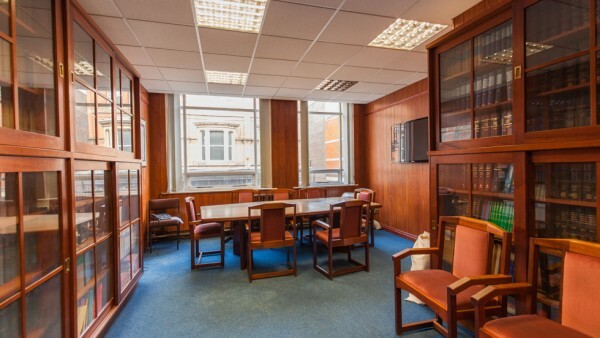 King Street is also home to other office occupiers including the law firm Platt & Fishwick. Wigan Council has announced it is investing more than £2 million to redevelop and revitalise the town centre. Plans for a new £15 million bus station in the town centre have also been approved. 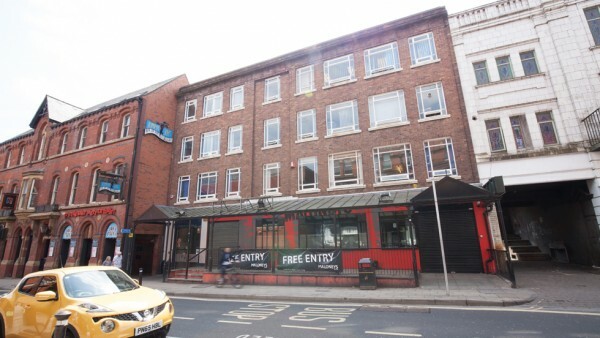 The property comprises a four storey building of steel framed construction with brick and glazed elevations. The ground, basement and part first floor trades as Maloneys and is used as a bar and club with back of house facilities including kitchens and WC’s. 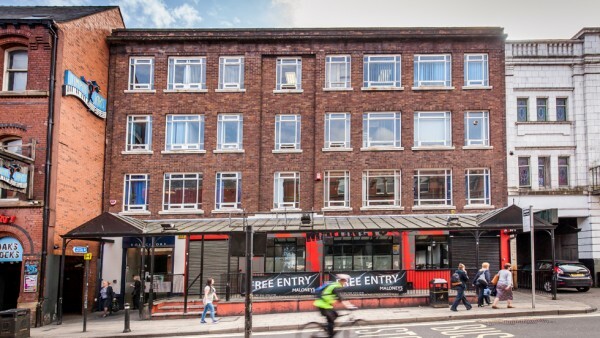 The upper floors have their own separate entrance via King Street and provide office accommodation which benefit from a passenger lift. 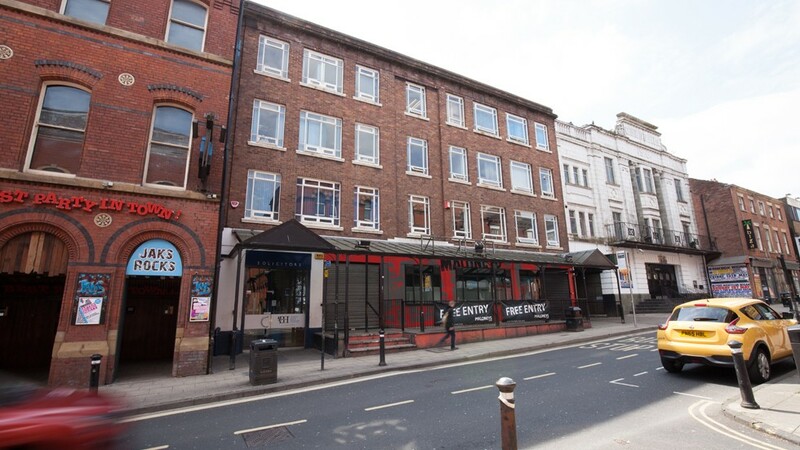 We are advised the property is located within the Wigan Town Centre Conservation Area. Please note that the property has also been measured in accordance with the new International Property Measurement Standard (IPMS). The Uniform Business Rate is 49.7 pence per pound for 2015/2016. The ground, basement and part first floor is let to Maloneys Limited on a full repairing and insuring lease for a term of 12 years from 29th September 2015, expiring on 28th September 2027. Therefore, there are approximately 11.25 years unexpired lease term. 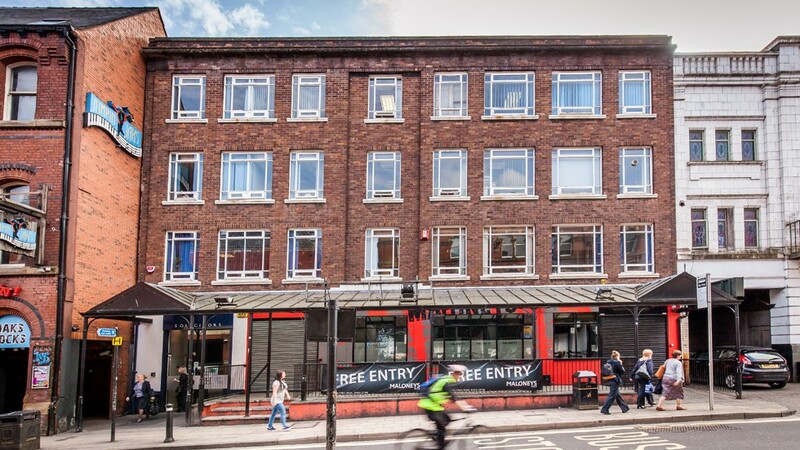 The current passing rent is £25,000 per annum (£94.96 per sq m / £8.82 per sq ft). The tenant currently pays rent monthly by way of an informal agreement with the Landlord. The lease benefits from 5 yearly rent reviews, the next being on 29th September 2020. The part ground and three upper floors are let to Messrs R.L. Alker, A.R.Bowden. 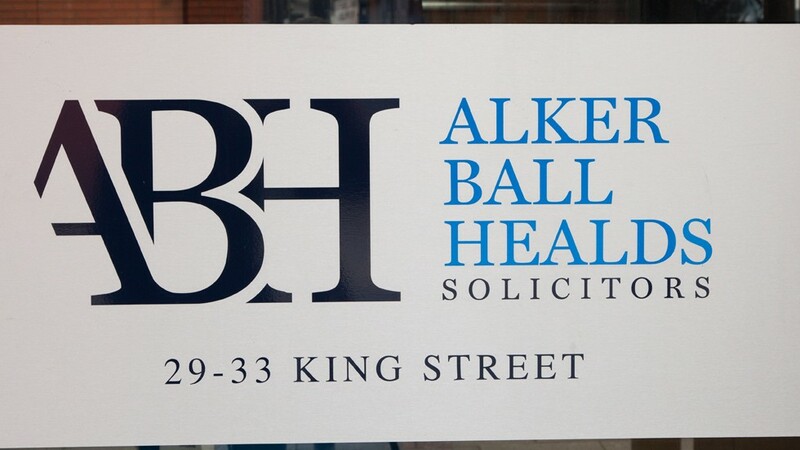 S.A.Dean and K.Whitehead, trading as Alker Ball Healds Solicitors, on a full repairing and insuring lease for a term of 15 years from 25th March 2003, expiring 24th March 2018. The current passing rent is £50,000 per annum (£88.73 per sq m / £8.24 per sq ft). The tenant has been in occupation since 1952. 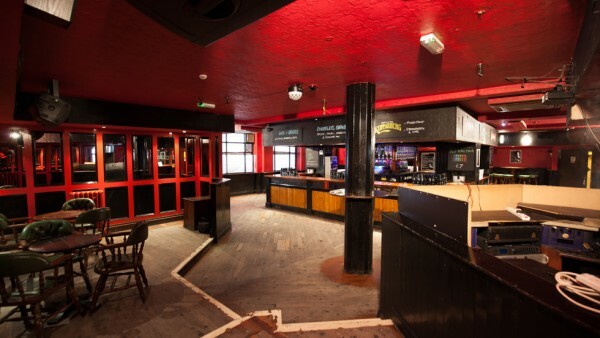 Therefore, an investor will benefit from a total income of £75,000 per annum. Alker Ball Healds Solicitors formed following the recent merger of two established local firms of Alker & Ball and Healds. 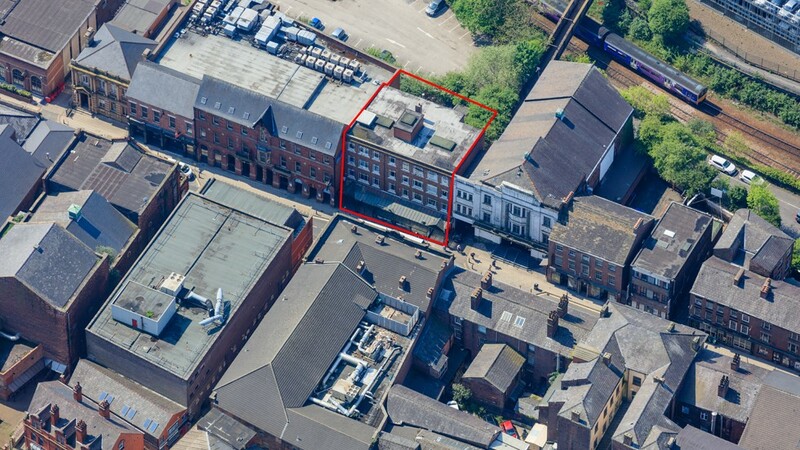 The firms have had a local presence in Wigan dating back to 1852 and the tenant has been in occupation of the subject property since 1952. 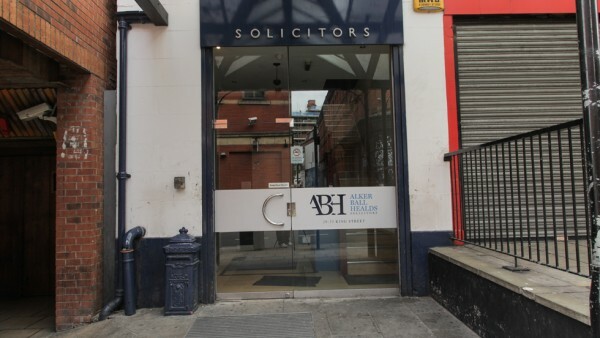 For further information visit http://www.abhlaw.co.uk. 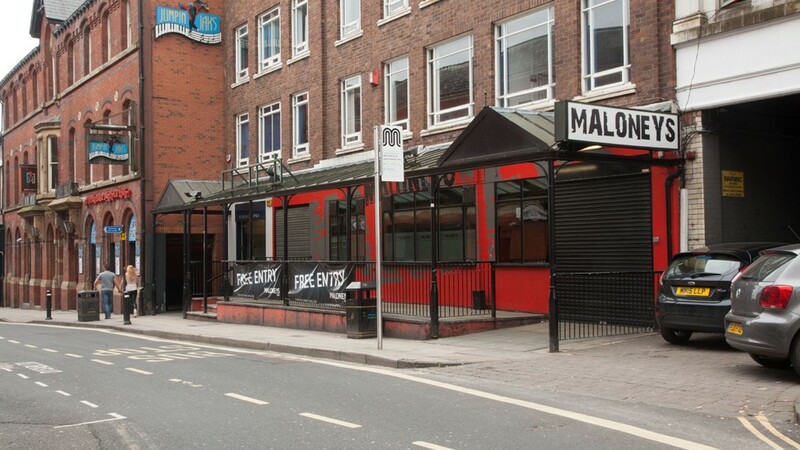 Maloneys is an established cocktail bar, owned by the Inn The Bar Group who have 14 public houses and bars within their portfolio. The property has not been registered for VAT. Therefore, no VAT will be payable. Our client is seeking offers in excess of £500,000 (Five Hundred Thousand Pounds), subject to contract, reflecting a net initial yield of 14.3% after deducting standard purchaser’s costs of 4.70%.